This activity aims at the development of genetically modified S. cerevisiae industrial strains suitable for the production of the selected dicarboxylic acids from side and waste streams rich in C5 sugars. This will require the identification of relevant metabolic routes, the development of a toolbox for engineering industrial strains of S. cerevisiae and rational and evolutionary strain engineering. The BioREFINE-2G project partners DTU and ULUND will tap into the Systems Biology toolbox of the Center for Biosustainability. The toolbox allows genome sequencing of novel industrial yeast strains, as well as gives access to tools for characterization of engineered strains using RNAseq, protein and metabolite profiling as well as flux analysis. 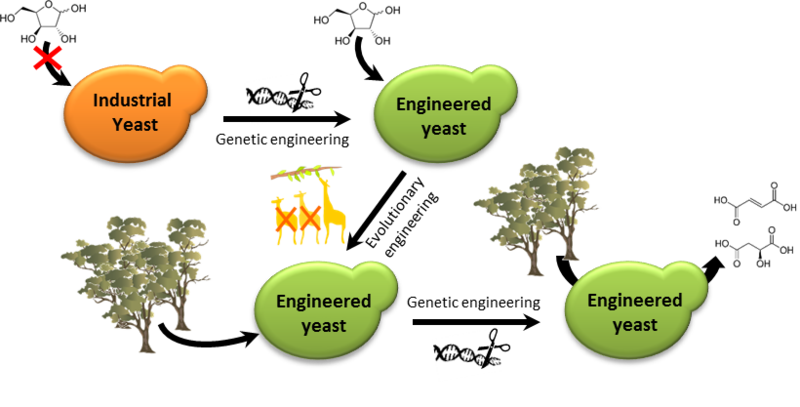 A genetic engineering toolbox for engineering polyploid, prototrophic industrial yeast has been established. The toolbox enables to carry out rapid gene deletions and insertions. 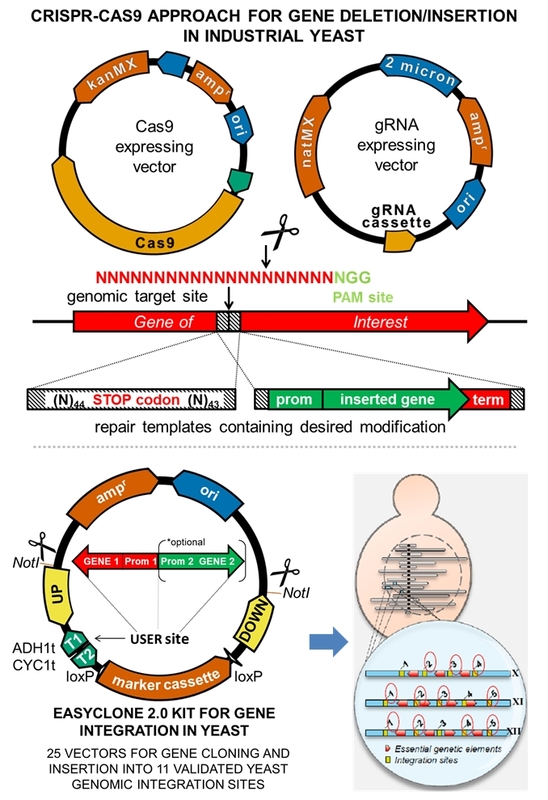 It consists of advanced molecular tools based on the CRISPR-Cas9 approach (see Figure 1). Industrial yeast strains can now be modified almost as fast as laboratory strains. For more details see our open-access publications. Figure 1: Genetic engineering toolbox for industrial yeast strains based on the CRISPR-Cas9 approach and a set of validated integrative vectors. S. cerevisiae strains do not naturally consume xylose (C5 sugar) which is the major component of hardwood biomass hydrolysates. Using advanced genetic tools, a selected industrial strain was rationally engineered for xylose utilization (read more about the engineering strategy here). Furthermore, the xylose consuming capabilities have been improved via evolutionary engineering. Such a whole genome-wide engineering approach allows for the selection of an improved phenotype under specific growth conditions. An adaptive evolution experiment was also carried out to obtain industrial strains tolerant to inhibitors derived from the biomass processing. Strains performing in the concentrated xylose-rich feedstock have been obtained. Further publications summarizing the results are currently in preparation. An engineering strategy leading to the production of dicarboxylic acids has been applied in the industrial strains tolerant to the biomass hydrolysate (see Figure 2). The strains currently produce a mixture of dicarboxylic acids and will be used for the scale-up process development. Some other strategies supposedly leading to an improvement of relevant dicarboxylic acid titers will be further applied. Figure 2: Schematic illustration of the engineering efforts leading to the generation of strains producing a mixture of dicarboxylic acids from a wood waste hydrolysate.